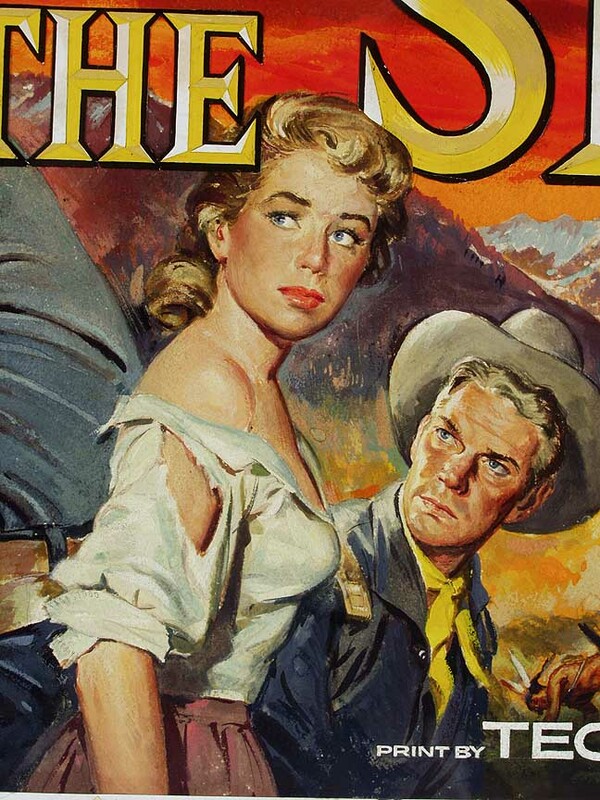 Reynold Brown | 50 Westerns From The 50s. 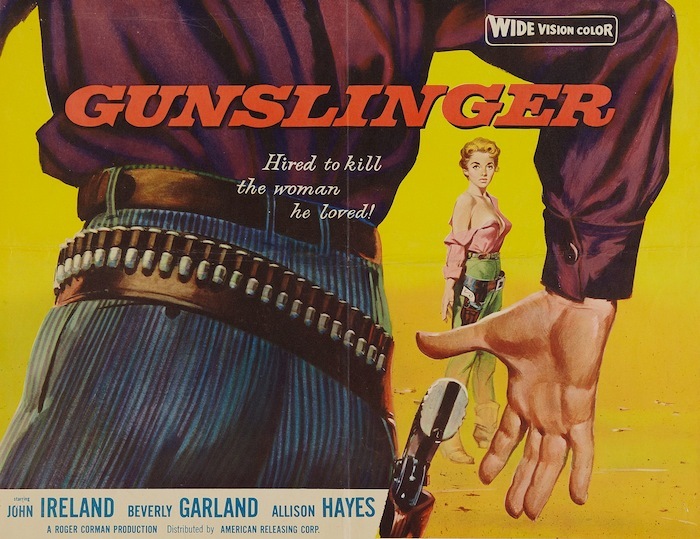 50s Westerns DVD News #134: Gunslinger (1956). 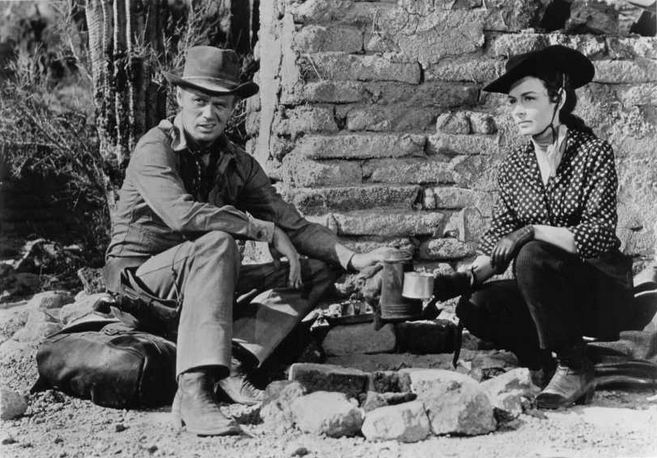 Roger Corman’s Gunslinger (1956), maybe my daughter’s favorite 50s Western (take that, Mystery Science Theater! ), has been announced for DVD release from Timeless Media Group on October 15. The set, another Movies 4 You Western Film Collection — also offers Clint Walker and Barry Sullivan in Yuma (1971), Terence Hill in the spaghetti western Man Of The East (1971) and Pioneer Woman (1973). An odd grouping, maybe, but you can’t beat the $6.95 list price. I’ve written about Gunslinger before, and I’m happy to know it’s going to be available Stateside. Beverly Garland is always terrific, and she’s so cool in this one. Not sure if it’ll be widescreen or not — the PAL version is, and it’s as nice-looking as this cheap little picture is probably capable of looking. And as ridiculous as it sounds, all of us in the Roan household would love to see it make its way to Blu-ray. UPDATE 9/30/13: Timeless has served up the same widescreen transfer of Gunslinger as the UK release. It’s 1.85, which AIP called “Wide Vision”on the poster. The contrast levels fluctuate a bit, probably the result of the constant rain that plagued its six-day shooting schedule — this is a nice transfer of a cheap movie. Any issues come from Iverson Ranch in 1956, not from the film transfer suite. 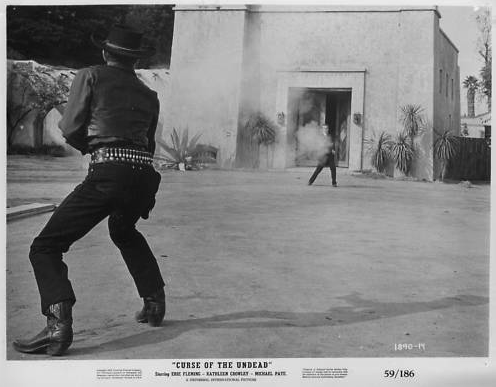 As far the other titles, Man Of The East looks terrific — I love the look of those Techniscope spaghetti westerns. Yuma is soft. What a great poster, too! Reynold Brown, I think. 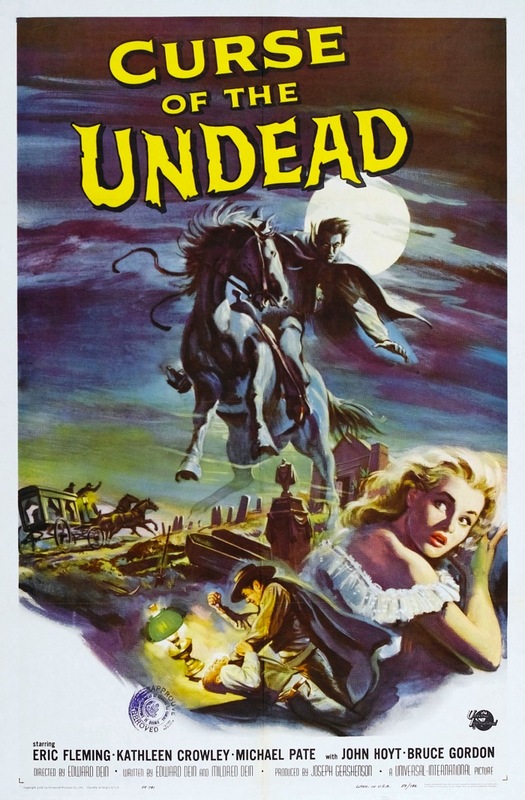 50s Monster Mash Blogathon: Curse Of The Undead (1959). CAST: Eric Fleming (Preacher Dan Young), Michael Pate (Drake Robey), Kathleen Crowley (Delores Carter), John Hoyt (Dr. Carter), Bruce Gordon (Buffer), Edward Binns, Jimmy Murphy, Helen Kleeb, Jay Adler. Also known as Mark Of The West. Working title: Affairs Of A Vampire. MGM had its musicals. 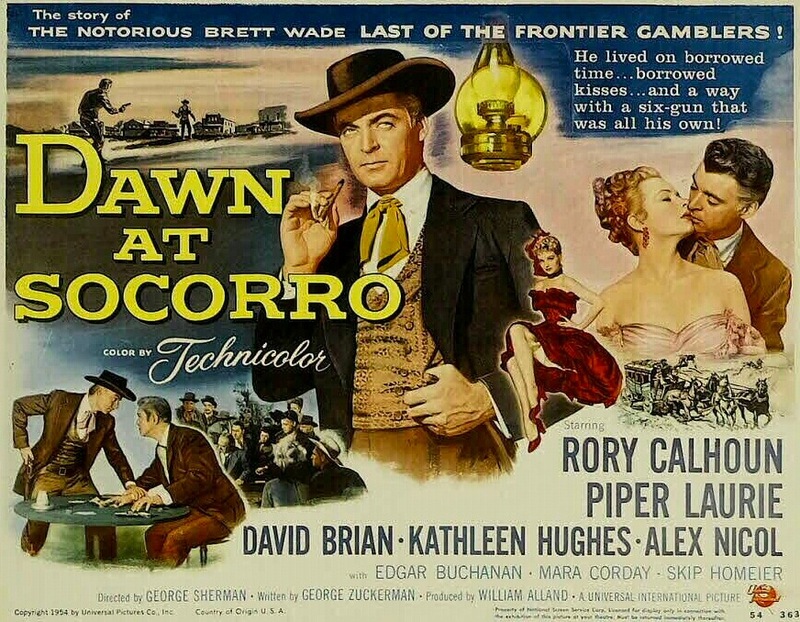 RKO had a real knack for film noir. The best gangster pictures came from Warner Bros. Republic made the really good serials. 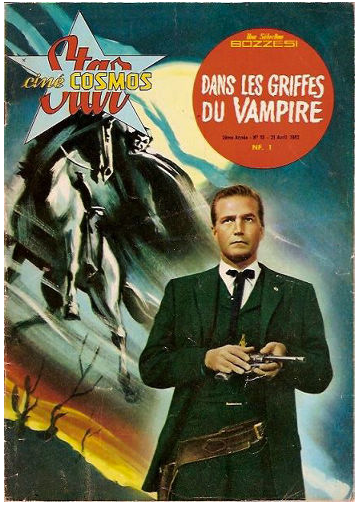 And from 1931 (with Dracula) through the Fifties, Universal absolutely owned the Horror Film — and they were no slouch when it came to 50s Westerns. But this wasn’t some Big Idea that came down from somebody at the studio. This genre-busting “vampire western” started out as a joke. 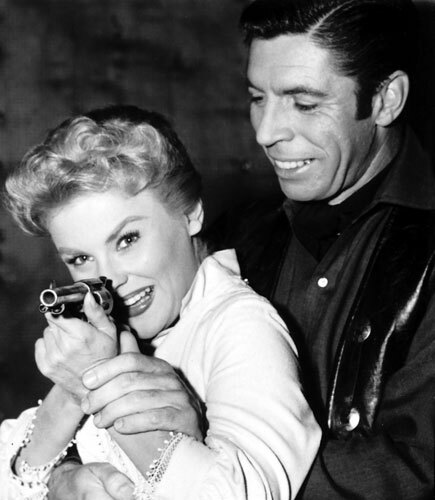 The story goes that writer-director Edward Dein and his wife Mildred wrote a screenplay as a lark — a satire about a gay vampire gunslinger biting the young men of a small Western town. Its title: Eat Me Gently. The Deins passed their gag script around their circle of friends, and it eventually wound up in the hands of Joseph Gershenson. A music supervisor and sometime producer at Universal-International with a list of credits as long as your arm, Gershenson saw a real movie in there somewhere, and the Deins set to work refashioning their screenplay into what would become Curse Of The Undead. A strange illness is killing young women in a small, unnamed Western town. The only clue: two small puncture wounds on each girl’s neck. Dr. John Carter (John Hoyt) and Preacher Dan Young (Eric Fleming) are baffled. It’s a scene we’ve seen played out many times, only minus the western wear. At the same time, Dr. Carter is being pressured by a local rancher, Buffer (Bruce Gordon), to sell his ranch — another familiar scene. Into these converging plotlines rides Drake Robey (Michael Pate), a gunslinger and vampire. Needing the blood to survive, he’s responsible for the mysterious deaths. And he’s working his way into the ranchers’ squabble, killing Dr. Carter and drinking the blood of his daughter Delores (Kathleen Crowley), who’s now in charge of her father’s ranch. Preacher Dan is engaged to Delores, and he begins to suspect that Robey is more than just a hired gun protecting the Carter ranch. Dan eventually discovers an old diary, where he learns of rancher Don Miguel, whose son Drago Robles returned from Spain to find that his beloved had been seduced by his brother Roberto. Drago killed Roberto, and overcome with grief, killed himself. This suicide cursed Drago to spend eternity among the undead. 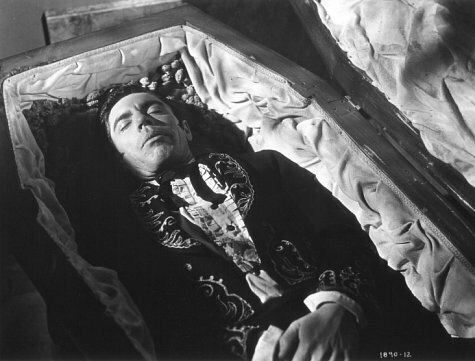 Michael Pate is quite good as the vampiric Robey/Robles. His approach to the material seems to set the tone of the whole film. Menacing and eerie, to be sure, but clearly in on the gag. Dein and Gershenson were wise to offer him the part. Eric Fleming, who plays Preacher Dan, was in the early days of his success as Gil Favor on TV’s Rawhide. 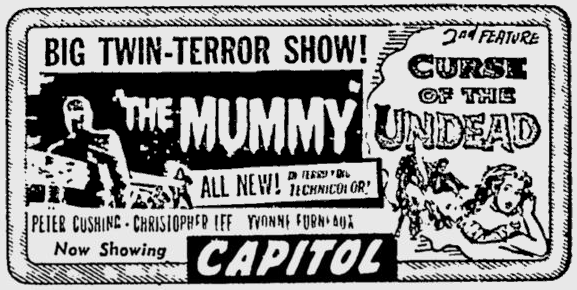 The show began its run in January of 1959, with Curse Of The Undead hitting theaters in July. Some of Fleming’s dour expression may have been the result of plastic surgery — a Seabee, his fac e was severely injured in an accident during World War II. Of course, much of the picture’s success has to be credited to the Deins. Edward had written Val Lewton’s The Leopard Man (1941, additional dialogue), The Cat Creeps (1946) and Seven Guns To Mesa (1958), so he came to Curse Of The Undead with experience in both horror and the Western. 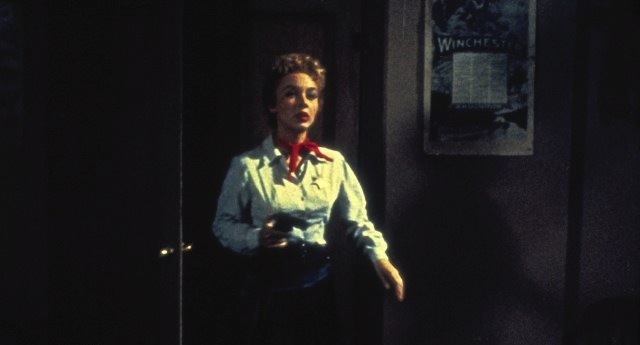 Mildred had worked on a number of her husband’s earlier scripts, including Shack Out On 101 (1955), a quite effective, and completely original, cheap noir picture. Pate is referring to the work of cinematographer Ellis W. Carter, a veteran of Universal sci-fi pictures from the period like The Mole People (1956), The Incredible Shrinking Man (1957), The Deadly Mantis (1957) and The Land Unknown (1957, in CinemaScope) — along with such 50s Westerns as The Texas Rangers (1951) and A Day Of Fury (1956). He gives the night scenes mood to spare. It’s genuinely eerie in spots, with a score that makes good use of the theremin. Curse Of The Undead deserves to be seen as more than a curio. A unique blending of the Western and horror film, it doesn’t cave to the cliches of either — and it’s a better movie for it. Just how much better is probably a matter of taste. Be sure to read some of the other fine posts making up the 50s Monster Mash Blogathon. Sources: The Astounding B Monster, It Came from Horrorwood by Tom Weaver, Universal-International Westerns, 1947-1963 by Gene Blottner. 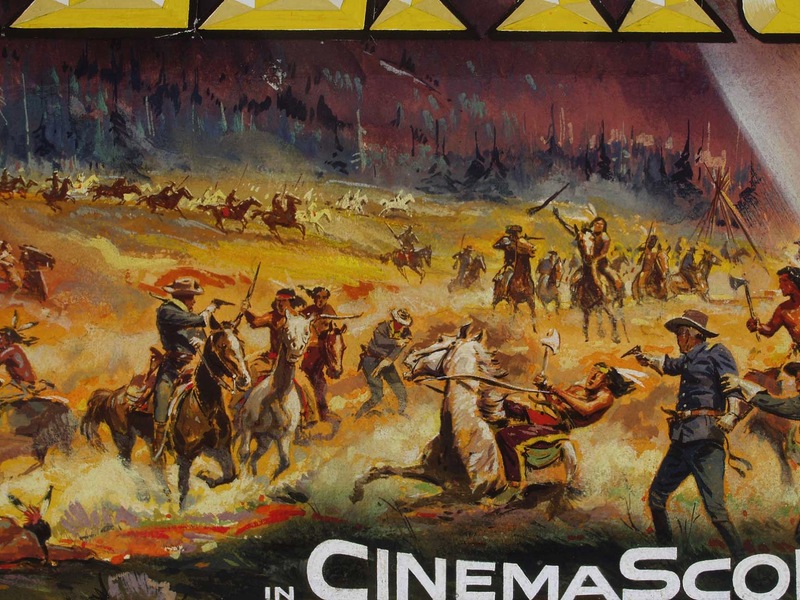 Here’s a few more of the Western posters Reynold Brown did for Universal-International. 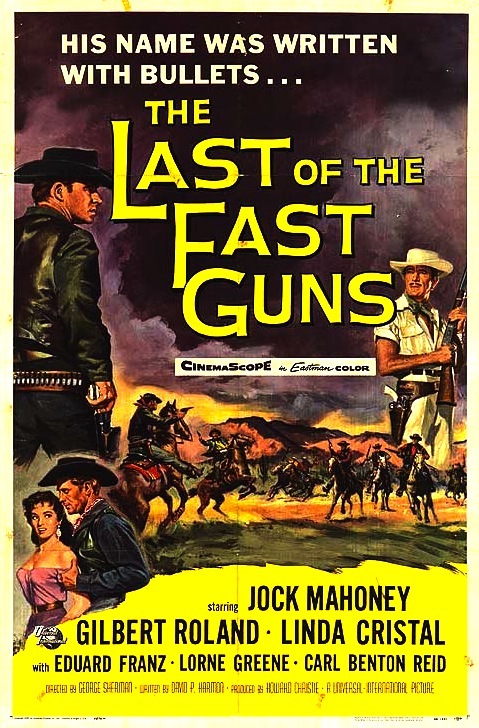 First up, The Last Of The Fast Guns (1958), directed by George Sherman. Note this boasts a “print by Technicolor,” which means they shot the film using the cheaper Eastmancolor monopack stock, then had real Technicolor prints made, ensuring that vivid color on a tighter budget. Universal-International was big on that trick. 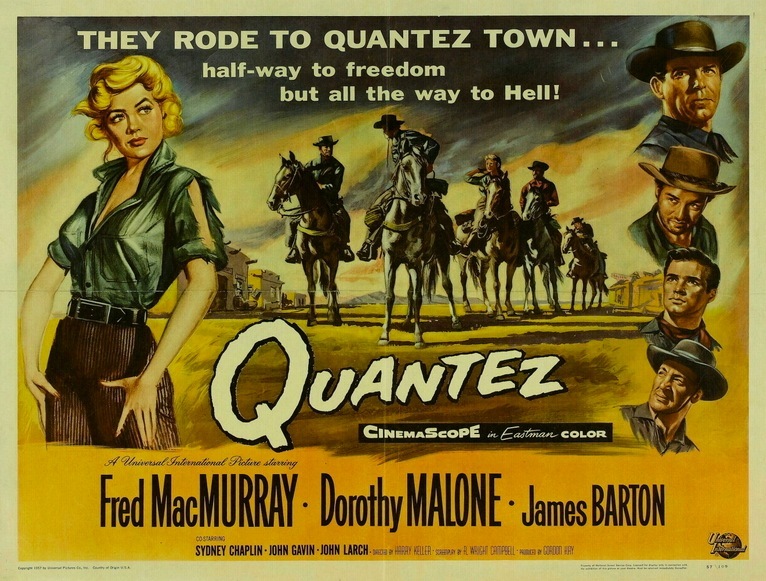 Quantez (1957) stars Fred MacMurray and Dorothy Malone. It was directed by Harry Keller, who around this same time was one of the uncredited directors doing re-shoots for U-I as they worked to “fix” Orson Welles’ Touch Of Evil. Poor Orson. 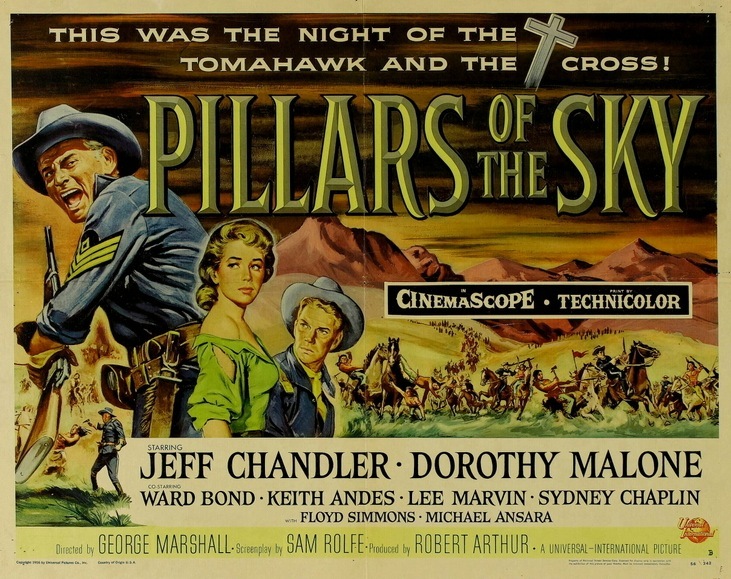 See Brown’s art for Pillars Of The Sky (1956) for another take on Dorothy Malone. 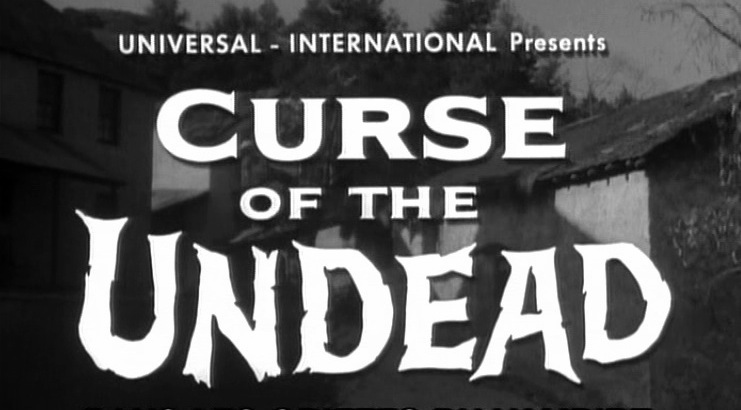 This genre-busting Universal-International effort from 1959, Curse Of The Undead, is a real curio. A unique blending of the Western and Horror Film, it doesn’t cave to the cliches of either — and it’s a better movie for it. Just how much better is probably a matter of taste. 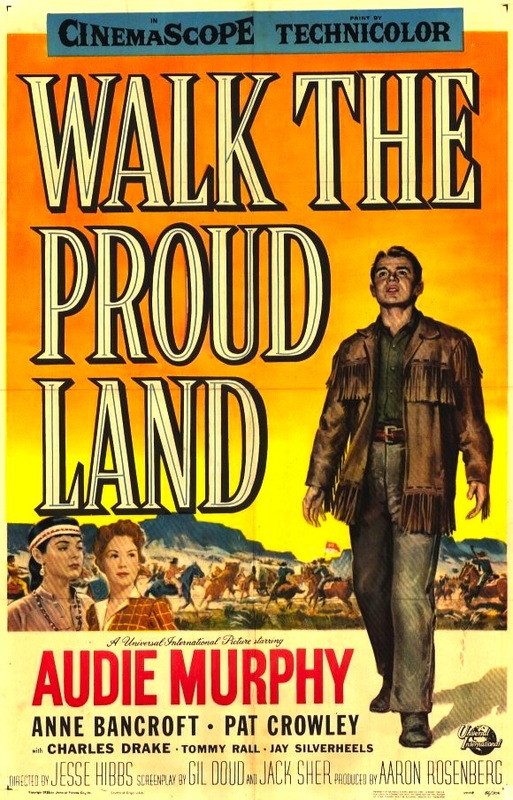 Starring Eric Fleming of Rawhide, it was produced by Joseph Gershenson, head of U-I’s music department. Almost impossibly hard to find, it was once available on VHS. It’s certainly worthy of 79 minutes of your time — just think, cowboys and vampires! — so contact your local bootlegger today. And dig that Reynold Brown poster art!